Many houseplants need humidity in order to survive so your bathroom can be the ideal place for some. It’s especially good if your house is dry as some plants that struggle in other rooms of the house will enjoy the steam from your bathroom. 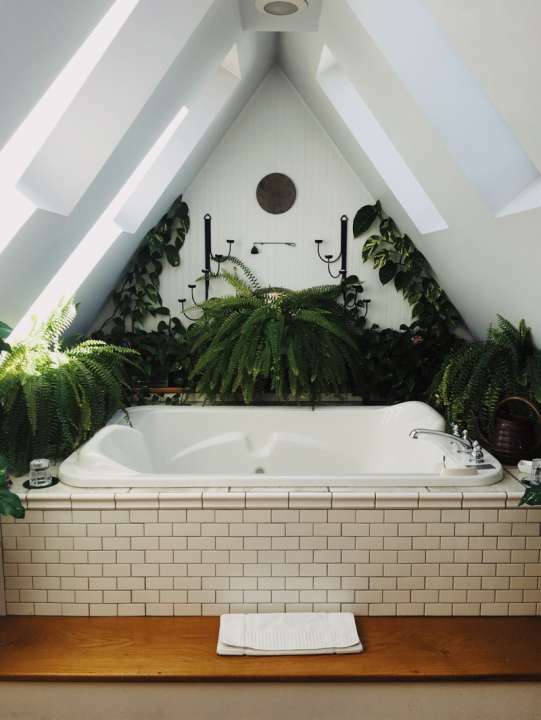 From large pots with big foliage to smaller pots on shelves and hanging plants, take your pick from these top 7 houseplants for your bathroom. Orchids are not keen on the cold, so these are perfect for bathrooms where the temperature doesn't fluctuate too much or get too cold. Orchids need the humidity to survive. With numerous different varieties to choose from, you can pick just the right colour for your bathroom. Considered one of the easiest houseplants to grow, Spider Plants can thrive in just about any room of the house, plus they easily produce little spider plants that can just be potted up. In the bathroom, they can be grown in pots but will look really lovely hanging in a macrame hanger. The beautiful white flowers are worth it for this not so easy to grow houseplant. They really like humidity so if they are placed in a bathroom with bright but indirect light, they can thrive. Similar to many tropical plants they aren’t the easiest to grow but in the right place Gardenia’s look stunning. With so many to choose from and now being readily available, air plants are the ideal plant to grow in a bathroom. They don't even need potting! The roots absorb moisture from the air so the humidity will keep them growing. Scatter them or hang them, they are the easiest of houseplants. A collection of ferns altogether in a bathroom can give a woodland theme to the room and whilst ferns can struggle in dry, modern houses, the humidity produced from your shower or bath will keep these thriving. Try the Boston Fern or Asparagus Fern on your bathroom shelves. There are thousands of Bromeliad species, with various colours and care needs but most houseplant Bromeliads need the kind of environment you bathroom provides. Bright but indirect light, humidity and a warm room. The colours are a true blast of the tropics. The China Doll plant is known to be somewhat temperamental, but with a few care tips its glossy green leaves are a superb addition to any home. It’s not keen on draughts and needs some indirect light with humidity, so perfect for a bathroom. If you are looking for some new plants to brighten up your bathroom, please come along and visit us or contact our team for advice!